The Toyota Yaris has a hot new look to set the streets ablaze, even if the British summer is slow to spread any seasonal sunshine. The new Yaris Orange Edition is defined by its zesty Orange Twist metallic paint, plus a host of style and equipment features inside and out. It’s an unmistakeable addition to the range, joining the line-up as Toyota celebrates three million Yaris having been built at its Valenciennes plant in northern France since production started in 2001. The Orange Edition’s bright bodywork strikes a strong contrast with black detailing, including the door mirror casings, rear pillar (creating a floating roof effect) and side sills, which feature an additional chrome flash. The effect is further heightened by a matt black finish for the honeycomb and a smart set of 16-inch machined-face alloys. Rear privacy glass is provided as standard, together with a fixed Skyview panoramic roof. In the cabin there is a black-on-black theme: the black headlining and instrument panel and new black and grey cloth upholstery matched by piano black finishes for the air vents, centre console and gear knob. The black carpet mats are hemmed with orange stitching. 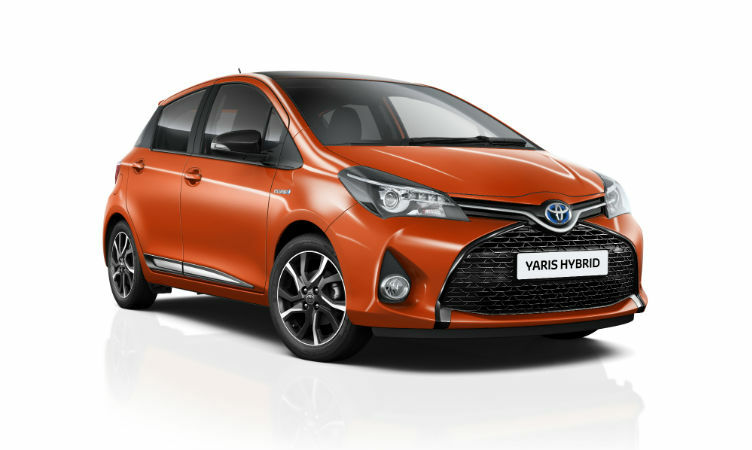 The specification is based on the current Yaris Icon, but adds plenty of appealing extras, including cruise control, automatic air conditioning (hybrid model), LED rear lights and a rear spoiler. Other features include the Toyota Touch 2 multimedia system with touchscreen control, reversing camera, projector headlights, LED daytime running lights, front fog lights with chrome surrounds and power windows front and rear. The five-door Yaris Orange Edition is available with three highly efficient engine choices: 1.33 VVT-i petrol with six-speed manual or CVT automatic gearbox; 1.4 D-4D diesel with manual transmission; and 1.5 VVT-i petrol hybrid. All are on sale now, with customer deliveries due to begin in August. Pricing is detailed below. Absolutely disappointed with the quality of your manufacturing. Bought a Brand New Yaris Hybrid roughly a month ago and today it has refused to start altogether due to a faulty yellow key light. Eventually have to call the breakdown service AA only to find out that it needs a trip to the dealership. In the first set of checks, the dealership is unable to figure out any faults through their computer systems and the misery continues……………. Eventually have to leave the car at the dealership now and waiting to hear back from them. Is this what you call quality of manufacturing? Is this why I bought a brand new car? We have replied to your earlier comment. Many thanks! Then u should have bought a petrol not hybrid. Do ur research Nxt time . I’ve got a 66 plate Toyota yaris orange edition 1.33 vvti cvt. I’m happy with it no problems it’s bin 4 weeks . Wicked car love it very power petrol all the way.